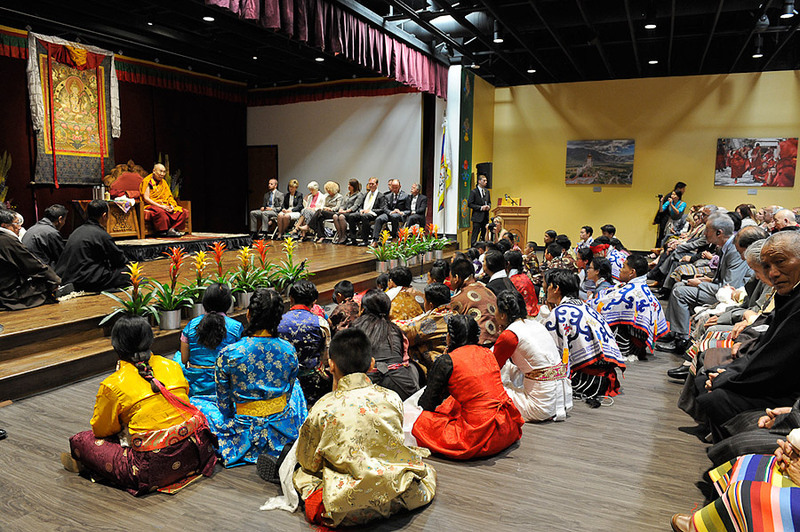 (TibetanReview.net, Jun25, 2016) – Tibet’s exiled spiritual leader, the Dalai Lama, on Jun 22 morning visited the newly established Utah Tibetan Community Hall, Salt Lake City, to a traditional Tibetan welcome. Salt Lake County Mayor Ben McAdams took part in the event. The mayor spoke of the honour he felt in being invited to participate in the gathering in His Holiness’s presence. He announced that the community he was representing had declared itself a compassionate community and planned to help the homeless, the elderly and others in need of support. The Dalai Lama talked about Tibetan culture and religion, which he said was the life force of the Tibetan people. He concluded his talk by leading the audience – children as well as adults – in a ceremony for taking refuge and generating the awakening mind of the bodhichitta. After lunch the Dalai Lama flew to Denver, Colorado, for his next engagement at the University of Colorado-Boulder.